Barcelona have been fined €19,000, for the celebrations that followed their historic comeback against Paris Saint-Germain in the Champions League. Neymar inspired the La Liga champions, to overturning a four-goal deficit to win 6-1 in the second leg at the Camp Nou. 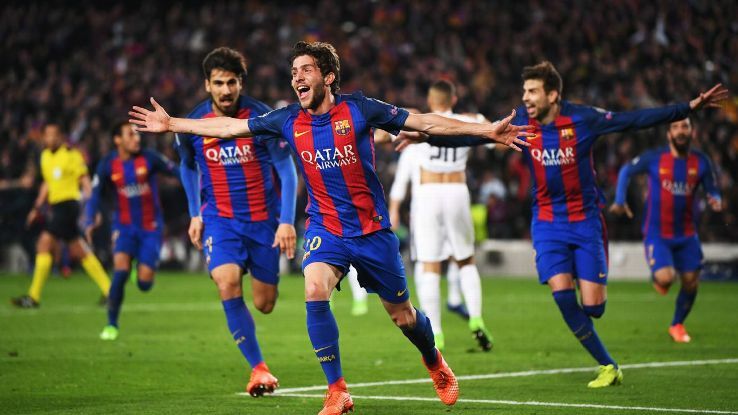 Sergi Roberto’s stoppage-time clincher, sparked wild scenes among the home fans with some of them invading the pitch. UEFA has now decided to fine Barca for “improper conduct of the team”. They picked up five yellow cards in the match. Earlier this week, UEFA president, Aleksander Ceferin, said that Deniz Aytekin, the referee who officiated the game, will not be suspended for his performance. PSG had reportedly written to UEFA last week, to complain about Aytekin’s refereeing. But Ceferin said there would be no sanctions for the referee. “We will not suspend the referee from that match, referees are not suspended,” he said. “When something doesn’t go well, we discuss it – but it is not a matter for suspension. Barcelona were trailing 4-0 from the first leg and were awarded two penalties at the Camp Nou, as they overturned the four-goal deficit. One of them given for Marquinhos’ foul on Luis Suarez was particularly controversial.